On Friday while speaking at the White House, Donald Trump said that Secretary of Defense James Mattis’ opposition to torture will override his own favorable opinion on torture. 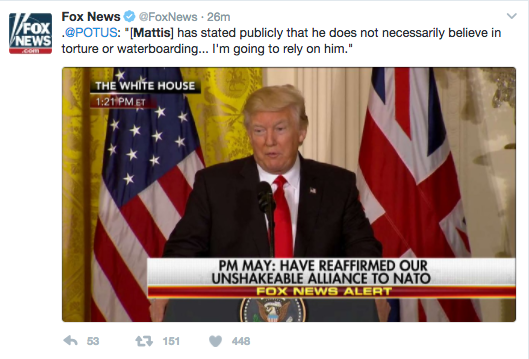 Trump said that despite that he does not “necessarily disagree” with Mattis on the issue, but he will let Mattis’ opinion “override” him. Mattis has publicly said that he does not support torture. Trump told the New York Times in November that he was surprised to hear Mattis’ opinion on torture when he asked him. “He said — I was surprised — he said, ‘I’ve never found it to be useful.’ He said, ‘I’ve always found, give me a pack of cigarettes and a couple of beers and I do better with that than I do with torture.,'” Trump told the New York Times.